Kay and Walter O’Malley head to Dodgertown in Vero Beach, Florida on the Dodger plane. 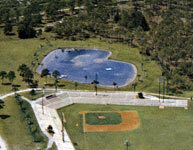 O’Malley was particularly interested in seeing his new pitch-and-putt golf course adjacent to his man-made, heart-shaped lake (as a Valentine to his wife Kay) adjacent to Holman Stadium, which opened the previous spring. O’Malley stocked the lake with fish and developed the golf course with input from the Dodger players in order to provide on-site recreational activities. He particularly wanted the minor league players to use all of the facilities, including movies, horseshoes, shuffleboard, table tennis and swimming. 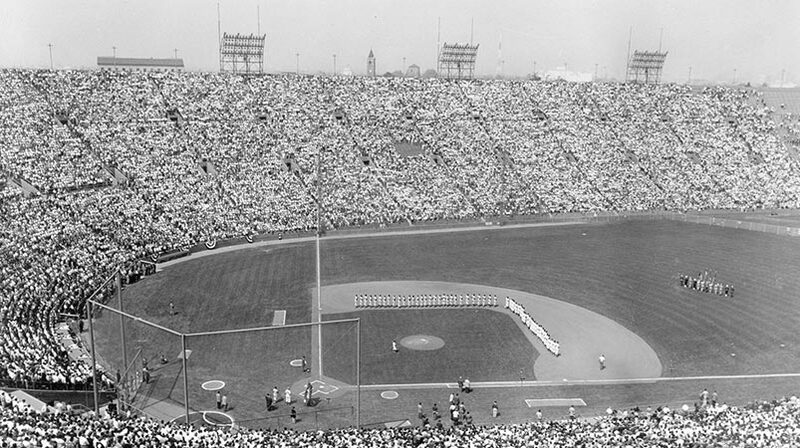 At a special meeting of the Board of Directors of the Dodgers, Walter O’Malley informs the Directors of the proposed license agreement submitted by the Los Angeles Coliseum Commission for the rental of the facility for the 1958 and 1959 seasons ($600,000 for two years). The Board unanimously approved a motion to execute the license agreement. Wally Karabian, the Associated Student Body President at the University of Southern California, presents an official Trojan blanket to Walter O’Malley in the opening ceremonies between the USC varsity baseball team and the Dodger All-Stars. Karabian went on to a highly successful career, becoming a partner in the Los Angeles law firm Karns & Karabian. He is also a former California state assemblyman and majority leader. In 1988, Los Angeles magazine (April issue) ranked him as one of the 20 most powerful individuals in the city. O’Malley remains on the USC campus for the festivities and game, after speaking to the Faculty Club at a luncheon that day. Some three hundred civic, baseball and newspaper representatives salute Vincent X. Flaherty, Los Angeles Examiner columnist for his extraordinary efforts and persistence in bringing Major League Baseball to Los Angeles. At the dinner hosted by the Masquers, an actors’ organization, at their club in Hollywood, Walter O’Malley told the audience, “Flaherty bombarded me with letters until I couldn’t ignore them. He sent messages with Charley (sp.) 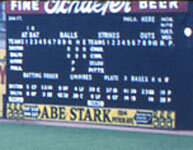 Dressen, and even tried to get Dressen to buy the club and move it west.”Ray Watson, The Sporting News, February 22, 1961 Flaherty began writing to O’Malley in Brooklyn in 1953 to encourage him to consider Los Angeles as a possible new home for the Dodgers.